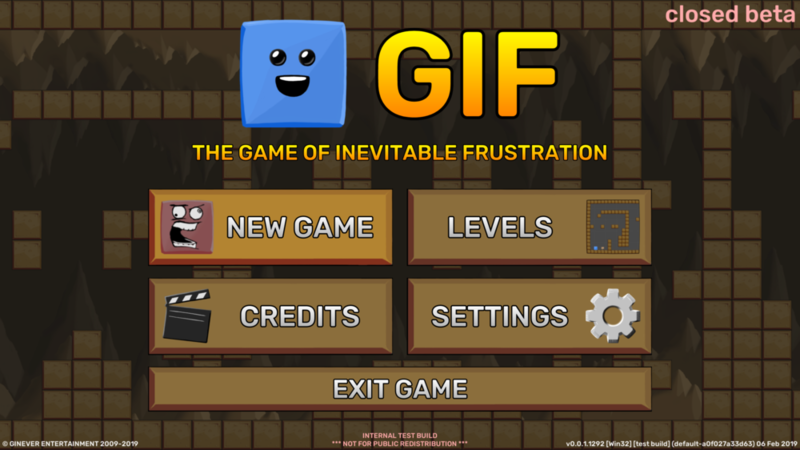 I'm pleased to announce that we are pursuing a release date of Friday 26 April for the commercial release of GIF! As of right now the game is practically complete (with only a couple art assets missing) so we are about 95% certain we can comfortably meet this date. The game will be initially available to buy on Windows, Mac and Linux (via Steam), Android (via Google Play), and iOS (via the App Store). The retail price of the game will be $1.99 (about £1.69 in the UK). Any proceeds made from the sale of the game will be put towards funding the next project. I have also been asked about whether we would be willing to release a DRM-free version of the game outside of the Steam store. The decision has been made not to pursue this option right now, because to release the game in that way the leaderboards would realistically have to be stripped out. It would also be much harder to issue updates and bug fixes to the game without using Steam. However, if there is a significant demand for a DRM-free version without the Steam functionality included, we will definitely look into that. We are nevertheless really excited to be able to finally announce the upcoming release of the PC and mobile versions of GIF! This is a huge milestone for us, and I'm very proud of everyone on the development staff for reaching this point. The production quality of the game is a lot higher than I could possibly have hoped for at the start of the project and I'm really happy with the way everything turned out in the end. So thanks to everyone who supported us and helped to make this happen! Look out for GIF, hopefully on sale from Friday 26 April! The development of GIF is proceeding at full pace. It's been around 6 months since the last blog post, so I figured I'd get everyone up to speed with the state of the game's development. I'm pleased to report that we have now completed the design and development of all levels. The final level to be completed, Suspension, was submitted by Paul on 26th January. To the best of my knowledge, the game should now be completely playable from start to finish without any major issues! 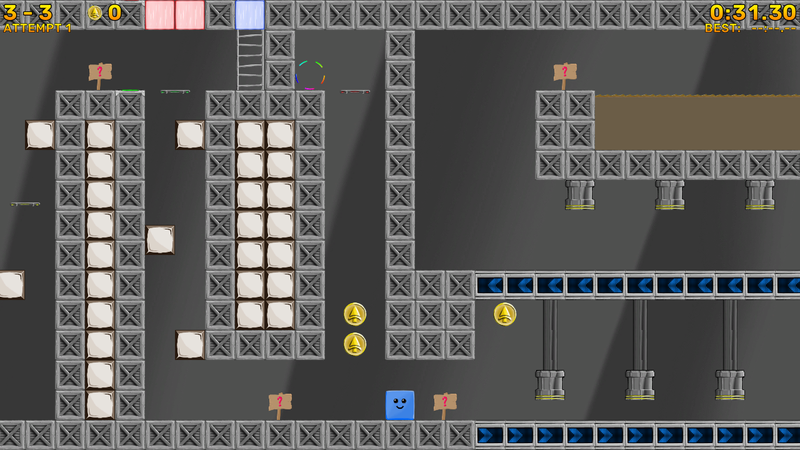 As a result, we are now working on polishing Several of the newer levels have been designed by Braydon who was previously focusing on music and sound. He turned out to be a really versatile and multi-talented guy and I think we're very lucky to have him on the team. In the last blog post, I talked about how we hadn't yet decided on what to call the "classic" zone. The name we ended up choosing was the cave zone. To go along with this, many of the levels have been thematically restyled in order to have a more cave-like feel to them - Braydon did a lot of work in this area. We've also added the previously promised parallax backgrounds to provide a really visually stunning appearance to the game. 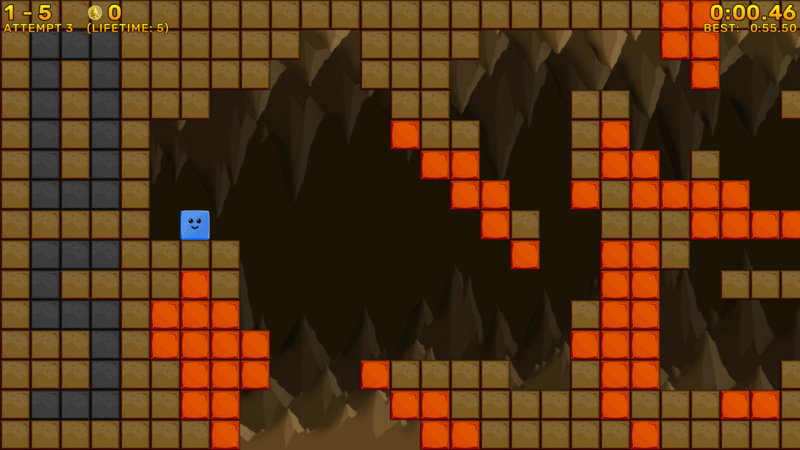 As you can see, the new version of the level has a sort of darker and more cave-like feel to it. This is something we have worked hard to push for, and it really shows - many of the levels have been greatly improved as a result of the work. If you compare to the original backgrounds, you can really see how much better these look, especially once you get in-game and see the parallax effect. Trevor has done an amazing job here and the effort has definitely paid off. 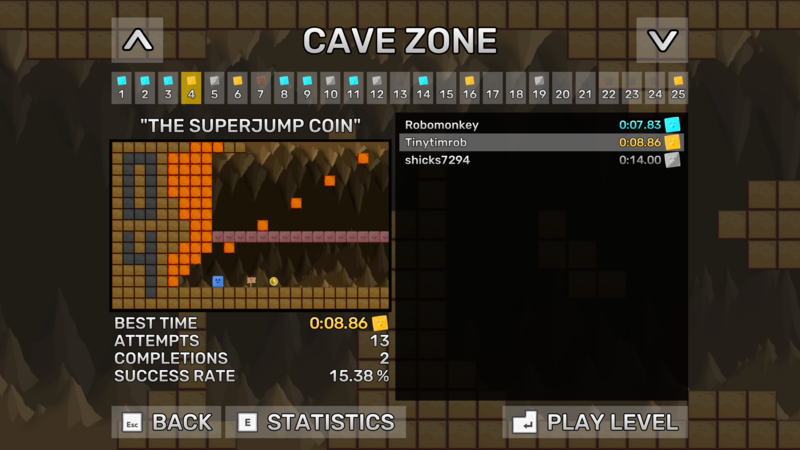 Of the 75 levels, 49 of them currently have medal times set, and both the cave and ice zones have had their levels ordered appropriately in order to make the difficulty increase gradual. 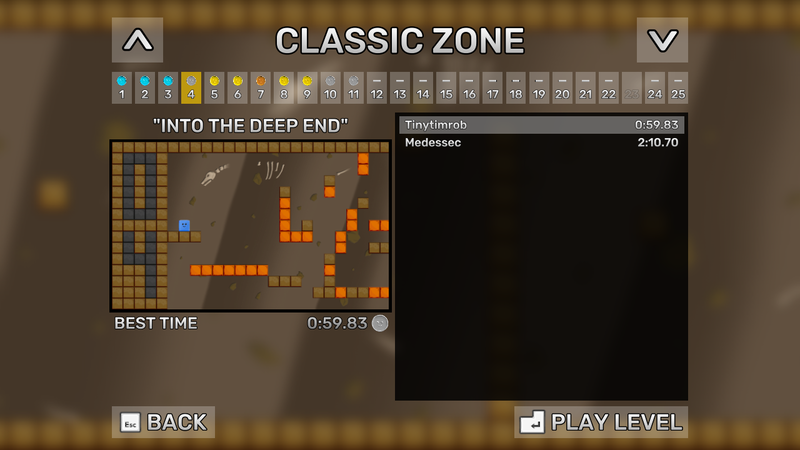 The remaining 26 levels without medal times set (1 ice zone level and all factory zone levels) are currently being worked on to figure out what medal times are appropriate, and the factory zone level ordering will follow shortly afterwards. This is a process I expect to take a few more weeks. 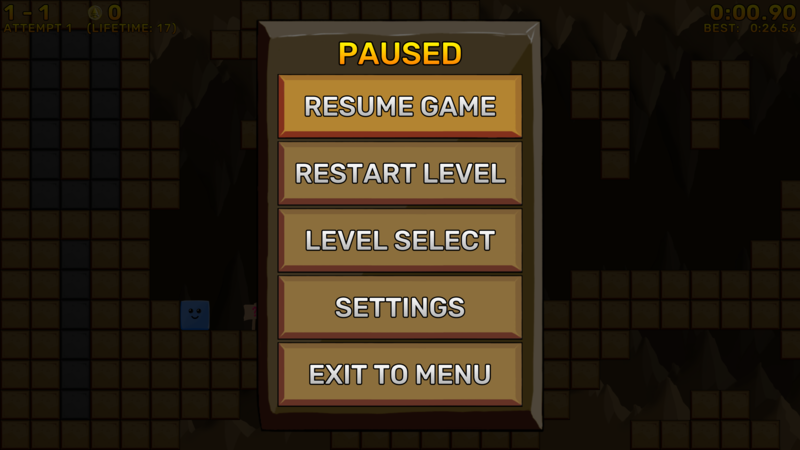 Most importantly, the settings menu can now be opened from either the main menu screen OR the in-game pause screen. 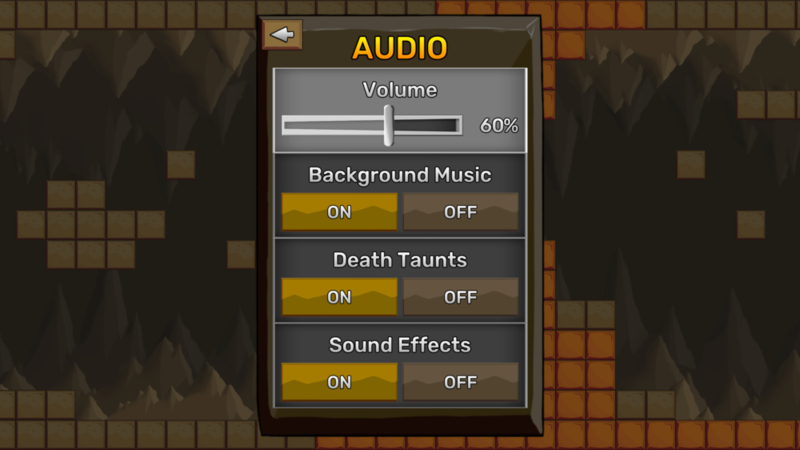 As a result, it is now possible to edit things such as audio volume or screen resolution without having to abandon play. The help sign system has been significantly improved. This works much better than the previous methods of either forcing the annoying popup to be displayed (like the original) or displaying it in an obtrusive fashion over the top of the level (like the remaster previously used to do). 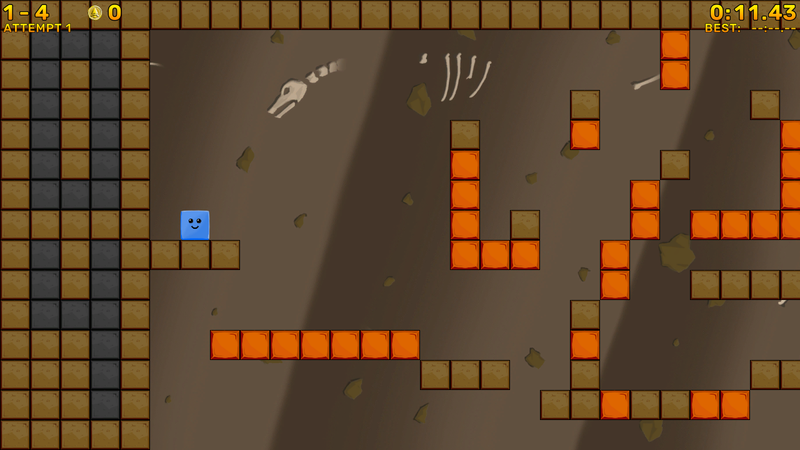 The level select screen is currently the area undergoing new work. 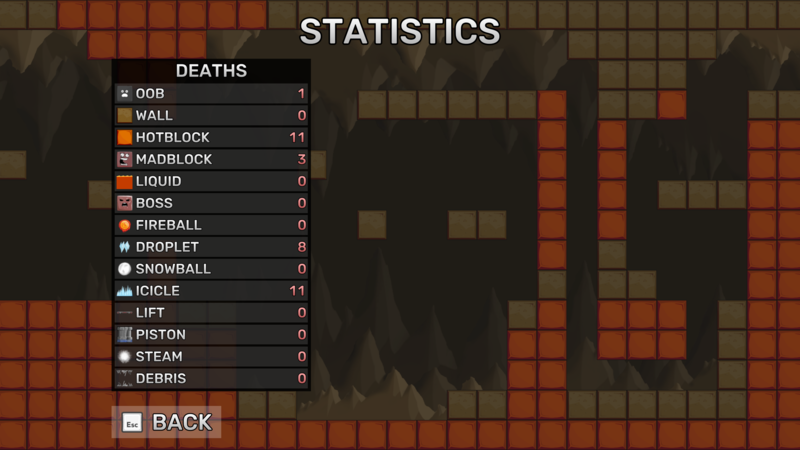 The PC/console version of this screen hasn't been skinned yet, but there are a couple of improvements to show. Firstly, the medal sprite has been updated and looks way more polished. Secondly, the leaderboard now has the best times colour-coded by medal type, with the medal being shown next to the time, and the timing numbers have been properly aligned to avoid visual discomfort. 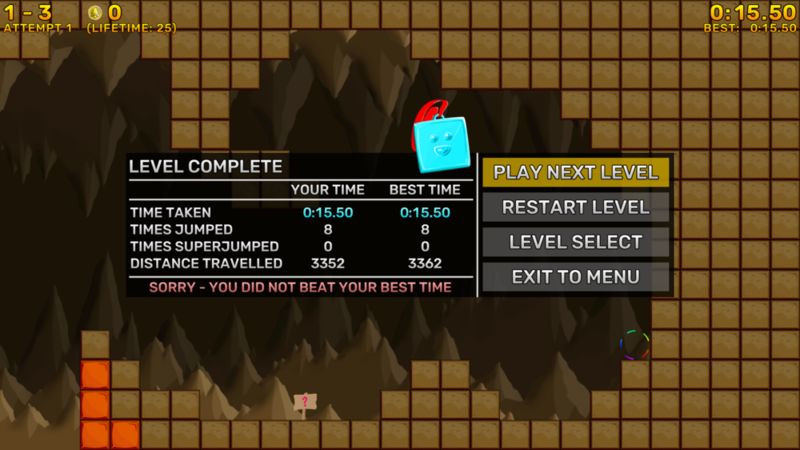 Thirdly, this screen now shows you how many attempts you've made on each level, how many times you completed it, and your overall success rate. 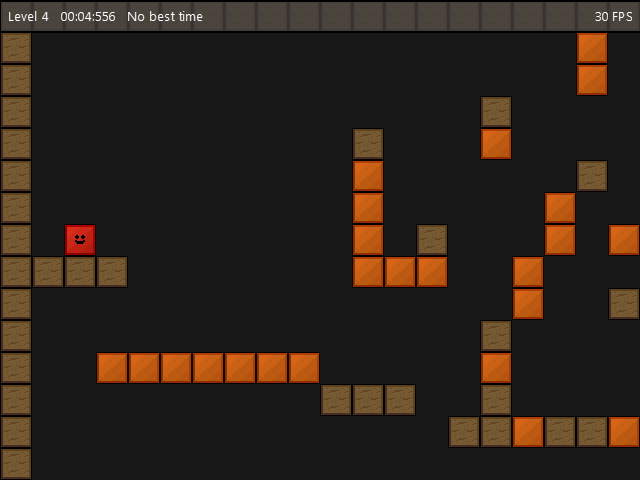 These screens are still a work-in-progress, and, as I said, they haven't been skinned yet. You can therefore expect them to look way better once the skinning is done. For mobile, we are hopefully going to design a completely new level select screen which features swiping to select levels. This hasn't been implemented yet though. This screen is, again, not skinned yet. You can expect to see some significant visual improvements here once the skinning is done. In addition to visual polish, the game has had a number of important performance improvements applied to it recently. The biggest area of work has been in collisions, with inaccessible blocks no longer having any collision mesh, and with the remaining blocks having caching groups applied in order to further reduce the number of collision calls. This has almost doubled the fps of the game on some phones, as well as helping to smooth out lag spikes, which is obviously really important for the mobile release. I am going to continue to look for areas where the performance can be improved over the coming weeks as we eek closer to the release deadline. I've also taken the time to improve the USB controller code. The game can now be played using the analog stick in addition to the d-pad thanks to a new subroutine which divides the analog stick into 8 equal segments in order to reliably determine which direction you intended to move in. It works really well - controlling the player is really consistent. There is also now a new setting which allows you to jump using the stick rather than using the jump button if you so wish (although IMO it makes the game significantly harder to play - serious players are likely to avoid it). The mobile touch controls have been improved in a similar way, and can now be resized so that you can set a comfortable control size for your device. The superjump button will now also disappear by default when not required (but if you dislike that behaviour, you can disable it in the settings menu). The medal system has been slightly adjusted too. You will now receive a "rusty" medal in the event that you complete a level but don't get a time worthy of the bronze rank (although we expect that most players will be able to hit bronze rank without too much difficulty). The rusty medal will not be worth any points towards unlocking the next zone, although the zone unlock restrictions are going to be relaxed a little. The idea is that you will be able to unlock the next zone either by A) getting enough points, or B) completing every level in the previous zone. This means that you can get 25 rusty medals and you will still advance to the following area. For this reason, the first play-through can be focused on just completing each level if you prefer, rather than worrying about how good a time you achieved. I hope this update has given a little insight into the state of the game right now, along with what you can expect going forward I can also pretty confidently say that we are really close to release now that all the game design work is essentially finished. Once the rest of the polishing is completed, I can see us handing the game over to the various publishing stores pretty promptly. We are also likely to start work on the trailer and advertising materials soon. If you're interested in this game, please check out the Discord server to keep up to date with the latest news and to hear promptly about any upcoming release announcements. The original plan with GIF was to build 4 zones, with around 30 levels per zone. 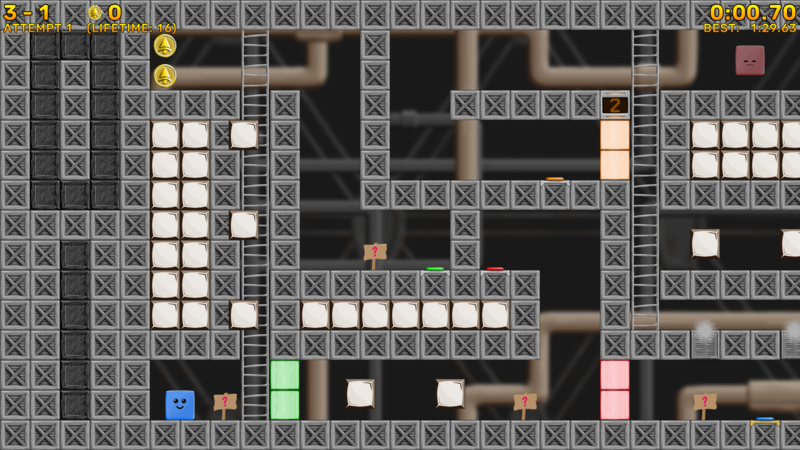 This was later revised down to 3 zones (classic, ice and factory) with 25 levels per zone, giving 75 in total (and of these, we have about 60 playable right now, with 5 or 6 more under development). The new HD remaster looks great even at resolutions as high as 4K, so I'm confident you will love it Trevor has done a really outstanding job. We've tried to maintain the original feel as closely as we can, while giving it that fresh, modern, professionally produced look that people have come to expect from video games nowadays. Hopefully that has paid off! You'll probably also notice here that we've swapped the madblock and player colours around. It seems to look nicer that way and helps the game to stand out a bit more from some other titles. The only aspect that really needs to undergo significant work for the classic zone is the backgrounds. We're going to replace them with parallax backgrounds. It's on the to-do list. Hopefully you can see a preview soon The rest of the zones also have this to look forward to, as they're using placeholder backgrounds right now which are just retints. So, how do the other zones differ? Well, the ice zone is designed around environmental hazards. 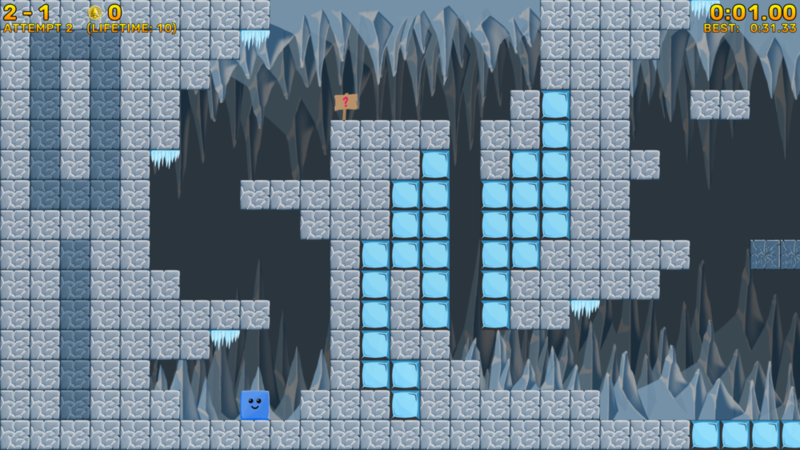 In this zone, you'll encounter things such as slippy floors, crumbling floors, dripping icicles, snowballs, snow blocks that fall to make new paths, etc. 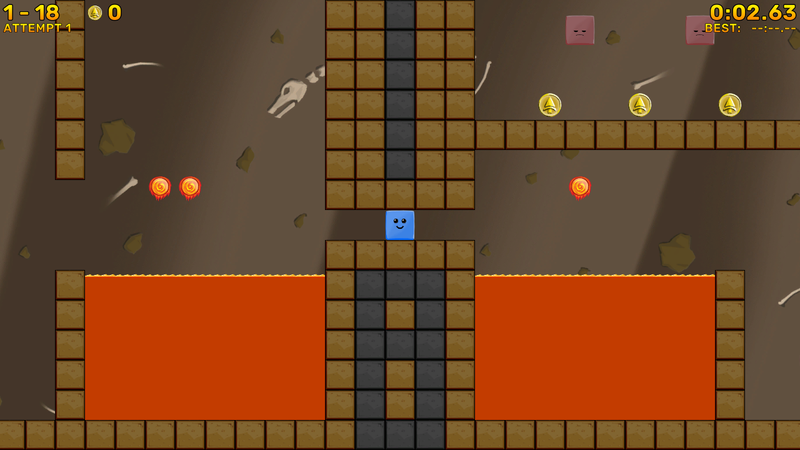 These new hazards add to most of those seen in the classic zone (hot blocks, mad blocks, invisible blocks and lava), albeit with retints to make them more fitting with the environment. We've also set up a medals system. Each zone requires a certain number of medal points to unlock, and each level will award you with a different medal worth different numbers of points (diamond, gold, silver, bronze or none) depending on how fast you completed it. This isn't fully implemented yet, but most of the work is done for it at this point. The PC version is fully integrated with Steam Cloud. 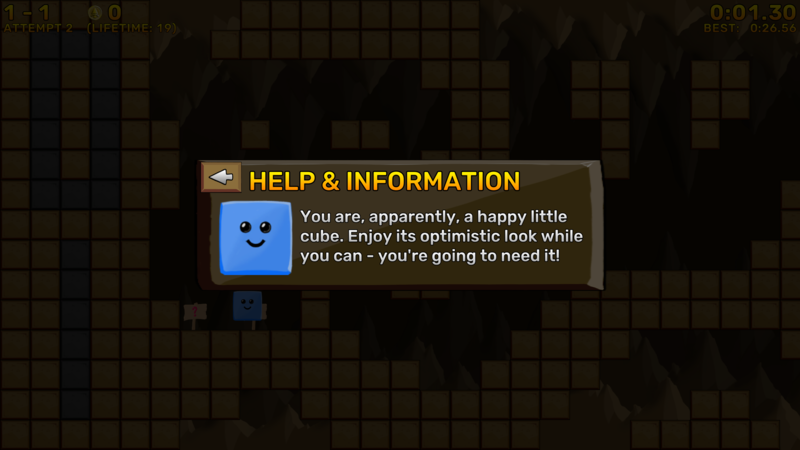 This means that you can play the game on one computer, and then when you switch to a different computer your progress will follow you. Yay! There is also support for per-user save files, with each Steam account having separate save data. The game now has full controller support. You can play using any XInput compatible controller. I've tested with Xbox 360 and Xbox One controllers and both work fine. Many of you are aware by now that we intended to launch this game on PC, Android and iOS. The builds on these platforms have been tested and are working decently (even on pretty old phones). What you might not know is that we're now also planning to release the game on Xbox One via the creator publishing system. Because of this, GIF will end up being our first game that reaches every major type of platform (desktop, mobile and console). I would love to also publish on PS4 and Switch, but this doesn't seem likely right now due to developer restrictions on those platforms (Microsoft is the friendliest to indie developers right now by a long shot), so our console port will only be launching on Xbox. This is still way better than I originally planned and I'm super excited about the possibilities of cross-platform releases. One of the original things I wanted to do for any new versions of GIF was to build an endless mode. We have an early concept for this working now. 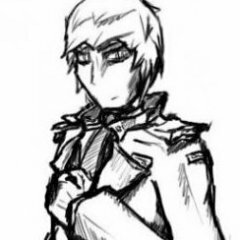 I don't want to reveal anything else at this stage, because at the moment I don't expect it to end up in the final release (there are a lot of pacing issues which I never thought about) but I'm at least floating it out there as a possibility. It looks like it might be a nice extra to play about with if we end up with spare time between the completion of the game and the official launch. I also really want to make some more zones (e.g. a magic zone, a poison zone, etc). I have some early concepts in my head for these. Right now, we've been considering a tower defense game as our next project, and we potentially have two new artists with 3D experience that might end up helping out with that, but don't hold your breath. Plans might change. Over the past few months, we have been working hard in our spare time to try and get the new version of GIF ready for release. Progress has been slower than I would have liked (because everyone has been really busy) but I'm pleased to say that things are looking pretty awesome! The new game will be split up into a bunch of themed zones. 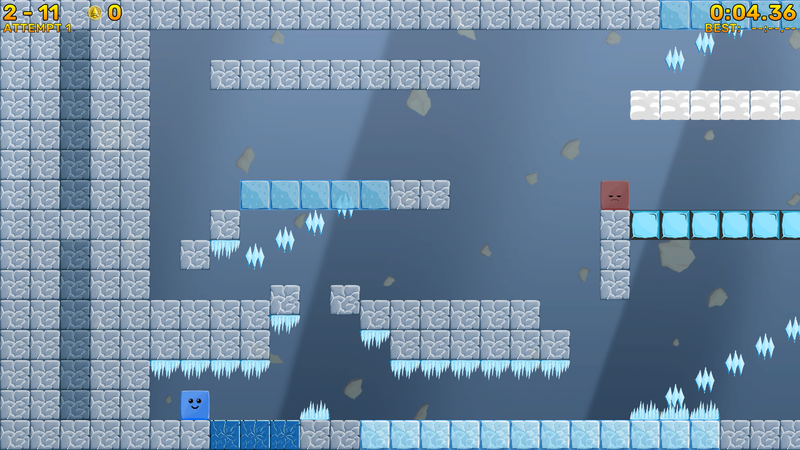 For the first version of the game, I'm targeting around 100 levels spread across three zones (classic, ice and factory) with about 30 levels each, along with maybe a couple of 'silly' or 'weird' levels to round off the set. At the moment we probably have about a third of that many, so there is still a good deal of work to do in order to make up the needed amount. A forest zone was also planned, but I've dropped it for now because I wasn't able to make it feel the way I originally intended. It might make a reappearance later, or it may just end up entirely on the scrapheap. I don't know yet. 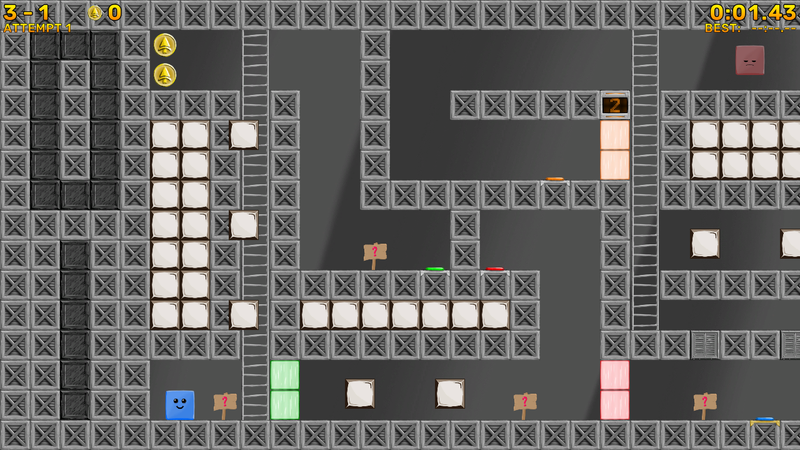 In the future, I would like to release level packs to expand the game, or release an official level editor to allow others to make their own levels, although that depends entirely on how successful the release is. The PC release will be out on Windows, Mac and Linux and distributed via Steam, priced at $1.99. I may also make it available on a platform which does not include any DRM, such as GOG, although this is not my immediate priority and if the game is released on a platform without DRM there may be a surcharge for this benefit. The mobile release will be out on iOS and Android, priced at $0.99, and there may also be a free ad-supported demo version on mobile (although I haven't completely made my mind up about this yet, as I detest obtrusive in-game advertising). Other platforms may follow in the distant future, but only if I can justify the development cost. Further updates will be coming shortly along with some previews of the game as it currently stands.